As we move toward the official celebration of my mother’s life, I sense that service will be the final duty of the daughter; the last thing before my mother moves beyond a physical presence and into the spirit realm. I carried her with me on my hike through wildflowers up Hamilton Mountain above the Columbia Gorge this week (you can read my Adventure Log here). She was here as I planted her geraniums under her bedroom window a few weeks ago (my bedroom now). Next year I expect I will plant something more to my own liking. As spring continues to burst forth, I feel her in the garden and in the woods. The ancient rhododendrons that flank the steps down to the house that haven’t had more than a single (at most) bloom in decades are loaded this year. Explain that. I can’t. In death, as in life, all is mystery. Two of my oldest friends, coincidentally in town at the same time, stayed at my house last weekend. A few others joined us for brunch on Sunday. Three of us were my mother’s Girl Scouts, and Marc’s mother was my mother’s Girl Scouting colleague and friend. 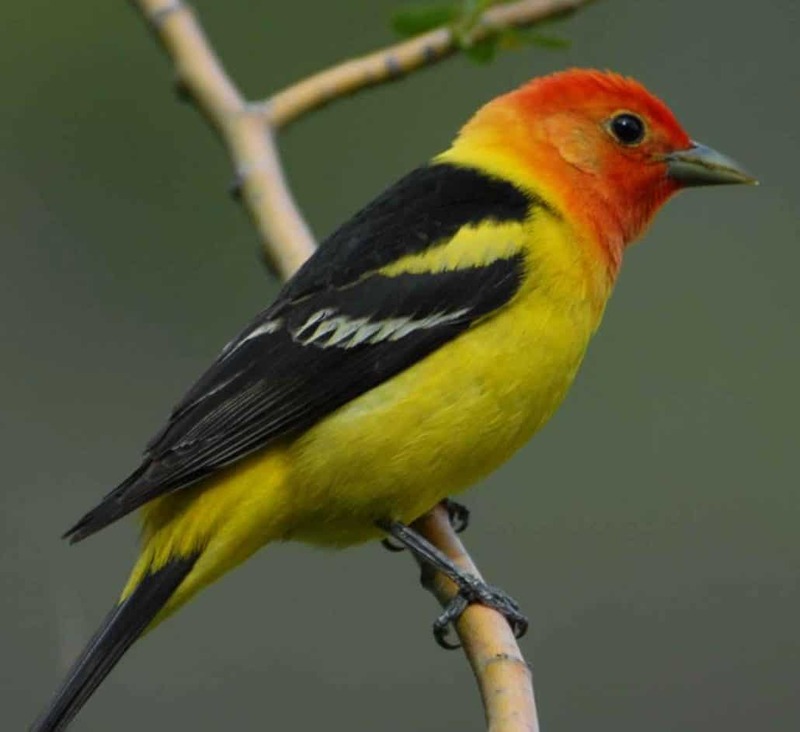 As we ate, a western Tanager alighted on the deck rail. It’s only the second time I’ve seen the colorful bird in the nearly six years I’ve been back here. We all felt visited. Some days I still find myself wondering if she really left her body that day last month. “You were there,” I have to keep telling myself. “You touched her motionless body; felt her non-beating heart; listened for non-existent breath; confirmed the stiffening of her empty shell.” Of course she was gone, I know she had moved on, but it still seems surreal, like maybe there was a mistake. My sisters and I are hard at work preparing for a service that will honor the one who birthed us and raised us and sent us out into the world. It will be held on June 9, two days before her 102nd birthday, at 2pm at the Centralia First United Methodist Church. I welcome your presence in person or in spirit. I thank you again for your accompaniment on this journey. A post following the service will be the last on these pages. It feels like a letting go of an old friend. I let go of my beloved 20-year-old CuRVy yesterday too. She been a grand partner on many adventures on both sides of the country and in between. It’s another loss, but it’s time for new adventures and a new vehicle (in Monarch orange), both for rolling along the byways and in which to write about them. I’m sure I will continue to write about my mother, her life, our life together as I move on to new bold ventures. She will be walking within me now, as I have walked with her for the past six years. I hope you will come with us at www.WritingDownTheStory.com. I don’t want to lose you! When my memoir is published—thinking boldly—I will let you know about here first! Have I said enough how grateful to you I am? It cannot possibly be expressed too much or too often. I bow to the divine light in each of you. Namaste. My father’s Four Fabulous Females on my mother’s 100th birthday. This entry was posted in Caring for a parent, Death & Dying, Retrospective, Writing Down the Story and tagged #writingdownthestory, caregiving, Death of a parent, moving on after a parent dies, Writing Down the Story by Gretchen Staebler. Bookmark the permalink.